Celebrity Reflection® recently received a few new enhancements during her recent dry dock. Now, you can experience a cinematic night under the stars with A Taste of Film at the Rooftop Terrace. It's an exciting way to enjoy the great outdoors, satisfy your love of movies, and dazzle your taste buds all at once. Treat yourself to spa innovations at the luxurious Canyon Ranch SpaClub® or visit our just-added shops for Tiffany and Swiss Watch on board. Celebrate the flavorful joys of outdoor grilling at the Lawn Club Grill. Enjoy more than 20 delicious dining options in the Main Restaurant. Unwind in your own cabana-style haven at The Alcoves. Your vacation time is precious. Time aboard Celebrity Reflection will make the most of it. 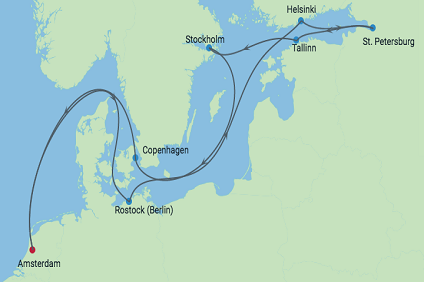 10 Night Cruise sailing from Dublin roundtrip aboard Celebrity Reflection. 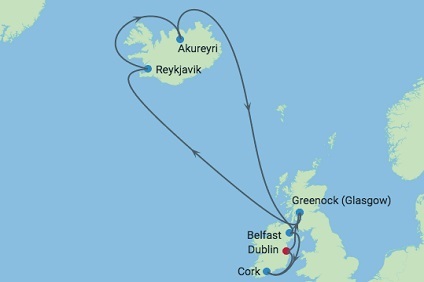 8 Night Cruise sailing from Dublin roundtrip aboard Celebrity Reflection. 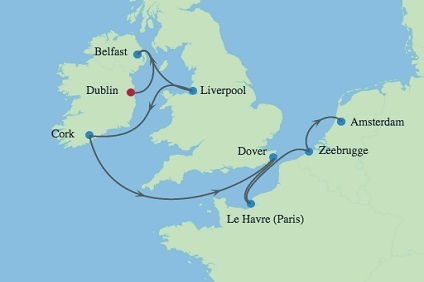 11 Night Cruise sailing from Dublin roundtrip aboard Celebrity Reflection. 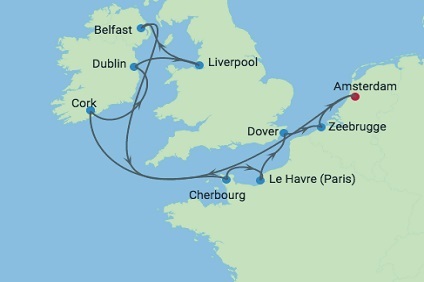 12 Night Cruise sailing from Dublin to Amsterdam aboard Celebrity Reflection. 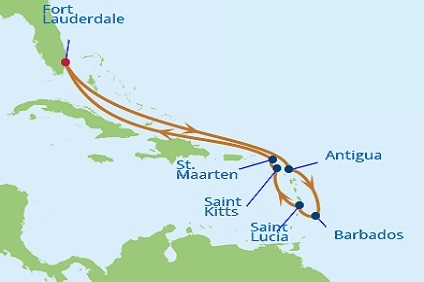 12 Night Cruise sailing from Amsterdam roundtrip aboard Celebrity Reflection. 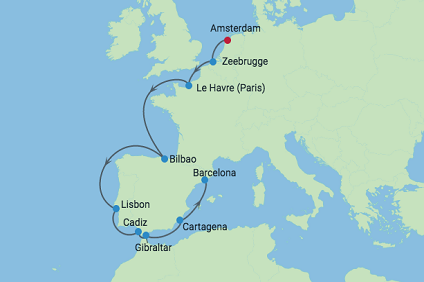 12 Night Cruise sailing from Amsterdam to Barcelona aboard Celebrity Reflection. 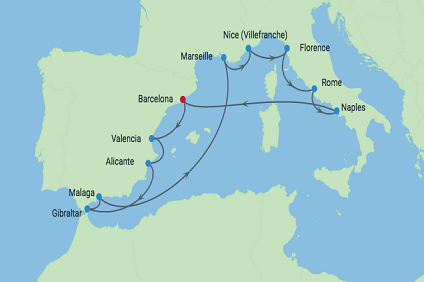 12 Night Cruise sailing from Barcelona roundtrip aboard Celebrity Reflection. 8 Night Cruise sailing from Lisbon to Barcelona aboard Celebrity Reflection. 13 Night Cruise sailing from Barcelona to Miami aboard Celebrity Reflection. 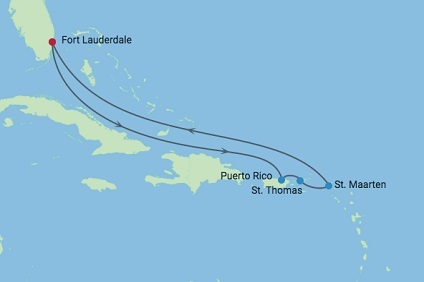 11 Night Cruise sailing from Ft Lauderdale roundtrip aboard Celebrity Reflection. 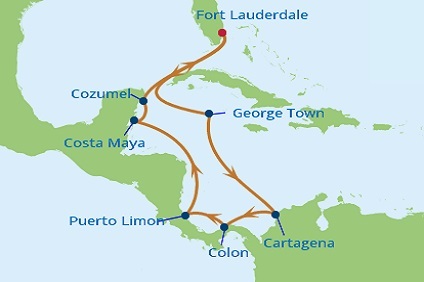 10 Night Cruise sailing from Ft Lauderdale roundtrip aboard Celebrity Reflection. 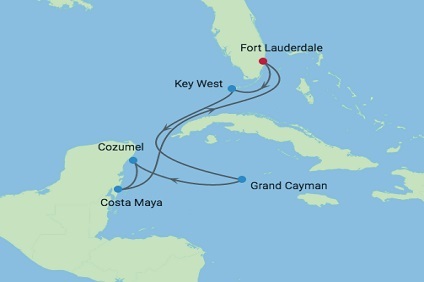 7 Night Cruise sailing from Ft Lauderdale roundtrip aboard Celebrity Reflection. The Reflection Suite-our fleet's first two-bedroom suite with sea-view bathroom-is nestled in the highly-desirable corner location near the new Signature Suites. This private section is accessible only to guests carrying a special cardkey. Here you'll sleep on a Premium Reverie® mattress with the ground-breaking Reverie® Dream Sleep SystemTM. An iPad® with the Reverie Remote app acts as a remote control allowing you to easily operate the lights and TV in the stateroom, massage features, and elevation of the mattress. Experience the luxury of European-style butler service 24/7 for assistance with unpacking, in-suite lunch and dinner, afternoon tea, evening hors d'oeuvres plus complimentary espresso and cappuccino. Sea-view bathroom extends out over the edge of the ship, veranda tubs offer a soothing rain shower, expansive veranda has lounge seating. Accommodates six. 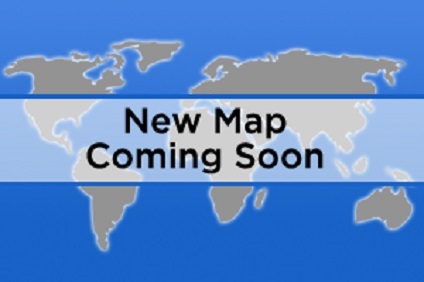 Features and Highlights Stateroom :1636 sq. ft.Veranda: 194 sq. ft. Features •Floor-to-ceiling windows and veranda doors to maximize stunning views of the sea •Reverie Dream Sleep System with technology controls available through an iPad •Extra-high 10-foot ceiling •Sea view bathroom with cantilever shower and veranda tubs •Living room with queen sleeper sofa and vanity •Mini refrigerator •40" LCD TV •Vanity •Bath with shower/tub combination and washbasin •Panoramic veranda with lounge seating and corner location •One complimentary dining reservation per suite for cruises of up to seven nights •Two complimentary dining reservations per suite for cruises of eight nights or longer •Butler at your service •Complimentary 24-hour room service •Priority check-in •Luggage delivery •Priority tender service •Welcome bottle of sparkling wine, fresh fruit & flowers •Assistance with packing and unpacking •Full in-suite breakfast, lunch & dinner service •In-suite afternoon tea service •Complimentary espresso & cappuccino (in suite) •Evening hors d'oeuvres, daily •Main & specialty restaurant seating preferences •100% Egyptian cotton oversized bath towels •Plush Frette® bathrobes •Complimentary shoeshine service •Celebrity tote bag •Delivery of requested board games •Celebrity tote bag •Dual voltage 110/220 AC •Bathroom accessories & hair dryer •Fresh cut flowers •Complimentary beach towel service •Plentiful storage space in your bathroom •Thermostat-controlled air-conditioning •Interactive television system to view & select shore excursions, order room service & watch movies* •Individual safe •Direct-dial telephone •Laundry service* •Mini-bar* *Additional charges apply. When you stay in one of our Penthouse Suites, you'll enjoy the luxury of European-style butler service. This includes assistance with unpacking and packing. In-suite lunch and dinner service. Afternoon tea. Evening hors d'oeuvres and complimentary espresso and cappuccino. We are sure you will be more than happy with the grandeur and scale of the space, along with all the amenities on offer, like the separate living room with dining area, guest bath and luxurious master bedroom. 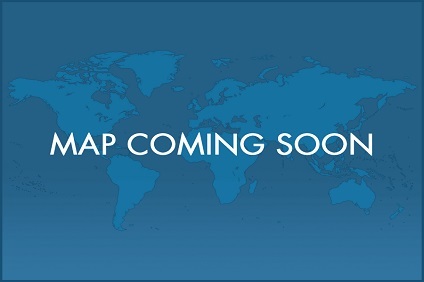 Features and Highlights Stateroom :1,291 sq. ft.Veranda: 389 sq.ft. Features •Floor-to-ceiling sliding glass doors •Separate living room with dining area •Baby grand piano •Queen sleeper sofa •Full bar •Lounge seating •Surround sound entertainment system with 52" LCD TV •Full guest bath •Veranda with whirlpool and lounge seating. Master bedroom features: •King size bed •52" LCD TV •Vanity •Walk-in closet •Marble master bath with whirlpool tub •Separate shower with dual shower heads •Double washbasins •26" LCD TV All Suites Include: •One complimentary dining reservation per suite for cruises of up to seven nights •Two complimentary dining reservations per suite for cruises of eight nights or longer •Butler at your service •Complimentary 24-hour room service •Priority check-in •Luggage delivery •Priority tender service •Welcome bottle of sparkling wine, fresh fruit & flowers •Assistance with packing and unpacking •Full in-suite breakfast, lunch & dinner service •In-suite afternoon tea service •Complimentary espresso & cappuccino (in suite) •Evening hors d'oeuvres, daily •Main & specialty restaurant seating preferences •100% Egyptian cotton oversized bath towels •Plush Frette® bathrobes •Complimentary shoeshine service •Celebrity tote bag •Delivery of requested board games •Celebrity tote bag •Dual voltage 110/220 AC •Bathroom accessories & hair dryer •Fresh cut flowers •Complimentary beach towel service •Plentiful storage space in your bathroom •Thermostat-controlled air-conditioning •Interactive television system to view & select shore excursions, order room service & watch movies* •Individual safe •Direct-dial telephone •Laundry service* •Mini-bar* *Additional charges apply. When you stay in a Royal Suite, you'll enjoy the luxury of European-style butler service. This includes assistance with unpacking and packing. In-suite lunch and dinner service. Afternoon tea. Evening hors d'oeuvres and complimentary espresso and cappuccino.Separate living room and dining area and a Veranda with whirlpool and lounge seating. Features and Highlights Stateroom :590 sq. ft.Veranda: 158 sq. ft. Features •Floor-to-ceiling sliding glass doors •Separate living room with dining area •Queen sleeper sofa •Lounge seating •Wet bar •Surround sound entertainment system with 52" LCD TV •Powder room •Veranda with whirlpool and lounge seating. Bedroom features: •Queen-size bed •40" LCD TV •Vanity •Walk-in closet •Master bath with whirlpool tub •Separate shower stall All Suites Include: •One complimentary dining reservation per suite for cruises of up to seven nights •Two complimentary dining reservations per suite for cruises of eight nights or longer •Butler at your service •Complimentary 24-hour room service •Priority check-in •Luggage delivery •Priority tender service •Welcome bottle of sparkling wine, fresh fruit & flowers •Assistance with packing and unpacking •Full in-suite breakfast, lunch & dinner service •In-suite afternoon tea service •Complimentary espresso & cappuccino (in suite) •Evening hors d'oeuvres, daily •Main & specialty restaurant seating preferences •100% Egyptian cotton oversized bath towels •Plush Frette® bathrobes •Complimentary shoeshine service •Celebrity tote bag •Delivery of requested board games •Celebrity tote bag •Dual voltage 110/220 AC •Bathroom accessories & hair dryer •Fresh cut flowers •Complimentary beach towel service •Plentiful storage space in your bathroom •Thermostat-controlled air-conditioning •Interactive television system to view & select shore excursions, order room service & watch movies* •Individual safe •Direct-dial telephone •Laundry service* •Mini-bar* *Additional charges apply. Book a spacious Signature Suite and you'll relax in airy, high-ceiling rooms and sleep on a Premium Reverie® mattress with the ground-breaking Reverie® Dream Sleep SystemTM. An iPad® with Reverie Remote app acts as a remote control allowing you to easily operate the lights and TV in the stateroom, massage features, and elevation of the mattress. You?ll also enjoy the luxury of European-style butler service 24/7 for assistance with unpacking, in-suite lunch and dinner, afternoon tea, evening hors d'oeuvres plus complimentary espresso and cappuccino. Veranda has luxe lounge seating and the bath offers a shower/tub combination. Located in a private area accessible only to Signature Suite and Reflection Suite guests carrying special cardkeys. Accommodates four. Features and Highlights Stateroom :441 sq. ft.Veranda: 118 sq. ft. Features •Floor-to-ceiling windows and veranda doors to maximize stunning views of the sea •Reverie Dream Sleep System with technology controls available through an iPad •Extra-high 10-foot ceiling •Sea view bathroom with cantilever shower and veranda tubs •Living room with queen sleeper sofa and vanity •Mini refrigerator •40" LCD TV •Vanity •Bath with shower/tub combination and washbasin •Panoramic veranda with lounge seating and corner location •One complimentary dining reservation per suite for cruises of up to seven nights •Two complimentary dining reservations per suite for cruises of eight nights or longer •Butler at your service •Complimentary 24-hour room service •Priority check-in •Luggage delivery •Priority tender service •Welcome bottle of sparkling wine, fresh fruit & flowers •Assistance with packing and unpacking •Full in-suite breakfast, lunch & dinner service •In-suite afternoon tea service •Complimentary espresso & cappuccino (in suite) •Evening hors d'oeuvres, daily •Main & specialty restaurant seating preferences •100% Egyptian cotton oversized bath towels •Plush Frette® bathrobes •Complimentary shoeshine service •Celebrity tote bag •Delivery of requested board games •Celebrity tote bag •Dual voltage 110/220 AC •Bathroom accessories & hair dryer •Fresh cut flowers •Complimentary beach towel service •Plentiful storage space in your bathroom •Thermostat-controlled air-conditioning •Interactive television system to view & select shore excursions, order room service & watch movies* •Individual safe •Direct-dial telephone •Laundry service* •Mini-bar* *Additional charges apply. When you stay in a Celebrity Suite, you'll enjoy the luxury of European-style butler service. This includes assistance with unpacking and packing. In-suite lunch and dinner service. Afternoon tea. Evening hors d'oeuvres and complimentary espresso and cappuccino. Features and Highlights Stateroom :394 sq. ft.Veranda: 105 sq. ft. Features •Floor-to-ceiling sliding glass doors •Living room with sectional queen sleeper sofa, , , and vanity •Lounge seating •Mini refrigerator •Surround sound entertainment system with 52" LCD TV •Vanity Bedroom features: •Two beds convertible to queen-size •40" LCD TV •Vanity •Walk-in closet •Dual access bath with shower/tub combination and washbasin •Veranda with lounge seating All Suites Include: •One complimentary dining reservation per suite for cruises of up to seven nights •Two complimentary dining reservations per suite for cruises of eight nights or longer •Butler at your service •Complimentary 24-hour room service •Priority check-in •Luggage delivery •Priority tender service •Welcome bottle of sparkling wine, fresh fruit & flowers •Assistance with packing and unpacking •Full in-suite breakfast, lunch & dinner service •In-suite afternoon tea service •Complimentary espresso & cappuccino (in suite) •Evening hors d'oeuvres, daily •Main & specialty restaurant seating preferences •100% Egyptian cotton oversized bath towels •Plush Frette® bathrobes •Complimentary shoeshine service •Celebrity tote bag •Delivery of requested board games •Celebrity tote bag •Dual voltage 110/220 AC •Bathroom accessories & hair dryer •Fresh cut flowers •Complimentary beach towel service •Plentiful storage space in your bathroom •Thermostat-controlled air-conditioning •Interactive television system to view & select shore excursions, order room service & watch movies* •Individual safe •Direct-dial telephone •Laundry service* •Mini-bar* *Additional charges apply. When you stay in a Sky Suite, you'll enjoy the luxury of European-style butler service. This includes assistance with unpacking and packing. In-suite lunch and dinner service. Afternoon tea. Evening hors d'oeuvres and complimentary espresso and cappuccino.Veranda with lounge seating and bath with shower/tub combination. Features and Highlights Stateroom :300 sq. ft.Veranda: 79 sq. ft. Features •Floor-to-ceiling sliding glass doors •Two beds convertible to queen-size •Bath with shower/tub combination and washbasin •Living room with queen sleeper sofa and vanity •Mini refrigerator •40" LCD TV •Veranda with lounge seating •Some staterooms in category S2 are wheelchair-accessible. 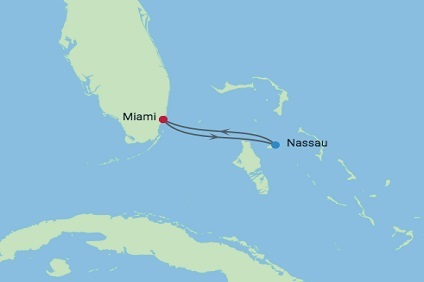 For more information on wheelchair-accessible staterooms, click here. Accessible staterooms with a sofa bed accommodate a maximum of three guests. Staterooms 2130, 2132, 2134 and 2136 have roll-in showers, no bathtubs. All Suites Include: •One complimentary dining reservation per suite for cruises of up to seven nights •Two complimentary dining reservations per suite for cruises of eight nights or longer •Butler at your service •Complimentary 24-hour room service •Priority check-in •Luggage delivery •Priority tender service •Welcome bottle of sparkling wine, fresh fruit & flowers •Assistance with packing and unpacking •Full in-suite breakfast, lunch & dinner service •In-suite afternoon tea service •Complimentary espresso & cappuccino (in suite) •Evening hors d'oeuvres, daily •Main & specialty restaurant seating preferences •100% Egyptian cotton oversized bath towels •Plush Frette® bathrobes •Complimentary shoeshine service •Celebrity tote bag •Delivery of requested board games •Celebrity tote bag •Dual voltage 110/220 AC •Bathroom accessories & hair dryer •Fresh cut flowers •Complimentary beach towel service •Plentiful storage space in your bathroom •Thermostat-controlled air-conditioning •Interactive television system to view & select shore excursions, order room service & watch movies* •Individual safe •Direct-dial telephone •Laundry service* •Mini-bar* *Additional charges apply. This new category of 130 double-occupancy staterooms, found only on Celebrity Solstice® Class, offers unlimited access to the AquaSpa® relaxation room and Persian Garden. If you love the spa there is no finer way to travel. Features and Highlights Stateroom :194 sq. ft.Veranda: 54 sq. ft. Features A brand new class of staterooms on Celebrity Reflection, AquaClass brings a tranquil, relaxing atmosphere into your stateroom, while providing unlimited access to many of the AquaSpa® amenities. Features: In addition to our Concierge Class amenities, AquaClass guests receive: •Priority seating in Blu, a specialty restaurant created just for AquaClass guests that also serves complimentary healthy continental breakfast daily •Double occupancy only •Premium ship location (Deck 11) close to the AquaSpa •Hansgrohe® shower panels •Aroma scent selections •Pillow menu to customize your night's sleep •Complimentary bathroom amenities •Daily deliveries of bottled water and teas •A Personal Spa Concierge to arrange AquaSpa treatments •Plush AquaClass Frette® bathrobes and slippers •Enhanced personal care products •Free, unlimited access to the Persian Garden and Relaxation Room •Special programming and wellness classes •Floor-to-ceiling sliding glass doors •Sitting area with sofa •Two beds convertible to queen-size •Vanity •32" LCD TV •Veranda with lounge seating •Some staterooms in this category are wheelchair-accessible. For more information on wheelchair-accessible staterooms, click here. Accessible staterooms with a sofa bed accommodate a maximum of three guests. AquaClass® Stateroom Include: •Two lower beds convertible to queen (except as noted) •Complimentary 24-hour room service •Dual voltage 110/220 AC •Four pillows in every stateroom •Complimentary use of bathrobes •100% Egyptian cotton towels •Bathroom accessories & hair dryer •Complimentary beach towel service •Plentiful storage space in your bathroom & wardrobe •Laundry service* •Luggage delivery •Interactive television system to view & select shore excursions, order room service & watch movies* •Individual safe •Direct-dial telephone •Thermostat-controlled air-conditioning •Mini-bar* •Some staterooms may have a trundle bed *Additional charges apply. 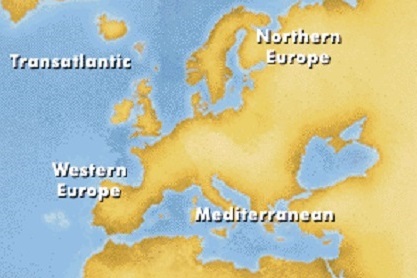 Note: Staterooms 1547, 1549, 1552 and 1554 have partially obstructed views. These veranda staterooms are set in the most desirable locations of the ship and are laid out in the same way as AquaClass® staterooms. Features and Highlights Stateroom :194 sq. ft.Veranda: 54 sq. ft. Features •Early embarkation and debarkation •Priority check-in •Welcome sparkling wine, fresh fruit and flowers •Main and specialty restaurant seating preferences •Expanded room service breakfast menu •Evening hors d'oeuvres, daily •Pillow menu, Plush Frette® bathrobes •Hansgrohe® massaging showerhead •Extra handheld hair dryer •Celebrity tote bag •100% Egyptian cotton oversized bath towels •Complimentary shoeshine service, use of golf umbrella and high quality binoculars •Floor-to-ceiling sliding glass doors •Sitting area with sofa •32" LCD TV •Vanity •Veranda with lounge seating •Some staterooms may have a trundle bed •Some staterooms in category C3 are wheelchair-accessible. Concierge Class Include: •Two lower beds convertible to queen (except as noted) •Complimentary 24-hour room service •Dual voltage 110/220 AC •Four pillows in every stateroom •Complimentary use of bathrobes •100% Egyptian cotton towels •Bathroom accessories & hair dryer •Complimentary beach towel service •Plentiful storage space in your bathroom & wardrobe •Laundry service* •Luggage delivery •Interactive television system to view & select shore excursions, order room service & watch movies* •Individual safe •Direct-dial telephone •Thermostat-controlled air-conditioning •Mini-bar* •Some staterooms may have a trundle bed *Additional charges apply. Stateroom Features All staterooms and suites come complete with private bathroom, vanity area, hair-dryer, interactive TV, radio and phone. XC - Concierge Class Guarantee All staterooms include: two twin beds that are convertible to queen-size (unless stated otherwise) and sitting area, private mini-bar*, interactive Samsung flat-screen television system to view and select shore excursions, order room service, and watch movies*, private safe, and dual voltage 110/220AC outlets. (194 square feet, veranda 54 sq ft) In addition our Concierge Class includes: Service- Included is priority check-in, priority disembarkation based on your travel needs, personalized concierge service, complimentary shoeshine service, express luggage delivery, main and specialty restaurant seating time preferences, and upgraded room service menu. Amenities- Included are complimentary welcome Blanc de Blancs sparkling wine, fresh fruit, fresh flowers, Plush Frette® bathrobes, oversized 100% cotton bath towels, pillow menu, extra handheld hair dryer, celebrity tote bag, personalized stationary, and use of binoculars and golf umbrella. Stateroom features a veranda and a Hansgrohe ® massaging showerhead. *Additional charges apply. Stateroom Features All staterooms and suites come complete with private bathroom, vanity area, hair-dryer, interactive TV, radio and phone. X - Guarantee Veranda All staterooms include: two twin beds that are convertible to queen-size (unless stated otherwise) and sitting area, private mini-bar*, interactive Samsung flat-screen television system to view and select shore excursions, order room service, and watch movies*, private safe, and dual voltage 110/220AC outlets. (194 square feet, veranda 54 square feet) Amenities included are: robe, custom blended bath products (shampoo, conditioner and lotion), shower cap, cotton balls and cotton swabs, water/wine glasses, Celebrity eXhale™ bedding featuring custom premium mattresses, plush duvets and pillows and 100% pure cotton linens, and hair dryer. Note: 2C Veranda Staterooms have partially obstructed veranda views, and 2D Veranda Staterooms have obstructed veranda views. *Additional charges apply. Window staterooms with a sitting area where you can kick back and relax after a day that has been as busy or relaxing as you want it. Features and Highlights Stateroom :177 sq. Features •Ocean view window •Two beds convertible to queen-size •Vanity •Hair dryer •32" LCD TV •Sitting area with sofa •Some cabins may have a trundle bed Note: Staterooms with an upper bed and sofa bed that sleeps two accommodate a maximum of four guests. All Staterooms Include: •Two lower beds convertible to queen (except as noted) •Complimentary 24-hour room service •Dual voltage 110/220 AC •Four pillows in every stateroom •Complimentary use of bathrobes •100% Egyptian cotton towels •Bathroom accessories & hair dryer •Complimentary beach towel service •Plentiful storage space in your bathroom & wardrobe •Laundry service* •Luggage delivery •Interactive television system to view & select shore excursions, order room service & watch movies* •Individual safe •Direct-dial telephone •Thermostat-controlled air-conditioning •Mini-bar* •Some staterooms may have a trundle bed Additional charge apply. Stateroom Features All staterooms and suites come complete with private bathroom, vanity area, hair-dryer, interactive TV, radio and phone. Y - Guarantee Ocean View All staterooms include: two twin beds that are convertible to queen-size (unless stated otherwise) and sitting area, private mini-bar*, interactive Samsung flat-screen television system to view and select shore excursions, order room service, and watch movies*, private safe, and dual voltage 110/220AC outlets. (177 square feet) Amenities included are: robe, custom blended bath products (shampoo, conditioner and lotion), shower cap, cotton balls and cotton swabs, water/wine glasses, Celebrity eXhale™ bedding featuring custom premium mattresses, plush duvets and pillows and 100% pure cotton linens, and hair dryer. *Additional charges apply. Stateroom with ample living space with a sofa and sitting area - a home away from home. Features and Highlights Stateroom :183 - 200 sq. ft. Features •Two beds convertible to queen-size •32" LCD TV •Vanity •Hair dryer •Sitting area with sofa •Some cabins may have a trundle bed •Some staterooms in categories 9 & 10 are wheelchair-accessible. 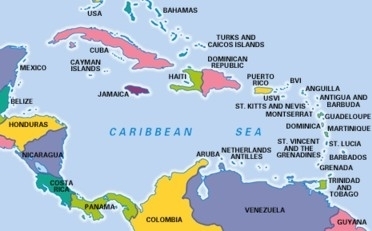 For more information on wheelchair-accessible staterooms, click here. All Staterooms Include: •Two lower beds convertible to queen (except as noted) •Complimentary 24-hour room service •Dual voltage 110/220 AC •Four pillows in every stateroom •Complimentary use of bathrobes •100% Egyptian cotton towels •Bathroom accessories & hair dryer •Complimentary beach towel service •Plentiful storage space in your bathroom & wardrobe •Laundry service* •Luggage delivery •Interactive television system to view & select shore excursions, order room service & watch movies* •Individual safe •Direct-dial telephone •Thermostat-controlled air-conditioning •Mini-bar* •Some staterooms may have a trundle bed *Additional charges apply. Stateroom with ample living space with a sofa and sitting area - a home away from home. Features and Highlights Stateroom :183 - 200 sq. ft.Veranda: N/A Features •Two beds convertible to queen-size •32" LCD TV •Vanity •Hair dryer •Sitting area with sofa •Some cabins may have a trundle bed •Some staterooms in categories 9 & 10 are wheelchair-accessible. All Staterooms Include: •Two lower beds convertible to queen (except as noted) •Complimentary 24-hour room service •Dual voltage 110/220 AC •Four pillows in every stateroom •Complimentary use of bathrobes •100% Egyptian cotton towels •Bathroom accessories & hair dryer •Complimentary beach towel service •Plentiful storage space in your bathroom & wardrobe •Laundry service* •Luggage delivery •Interactive television system to view & select shore excursions, order room service & watch movies* •Individual safe •Direct-dial telephone •Thermostat-controlled air-conditioning •Mini-bar* •Some staterooms may have a trundle bed *Additional charges apply. Stateroom with ample living space with a sofa and sitting area - a home away from home. Features and Highlights Stateroom :183 - 200 sq. ft. Features •Two beds convertible to queen-size •32" LCD TV •Vanity •Hair dryer •Sitting area with sofa •Some cabins may have a trundle bed All Staterooms Include: •Two lower beds convertible to queen (except as noted) •Complimentary 24-hour room service •Dual voltage 110/220 AC •Four pillows in every stateroom •Complimentary use of bathrobes •100% Egyptian cotton towels •Bathroom accessories & hair dryer •Complimentary beach towel service •Plentiful storage space in your bathroom & wardrobe •Laundry service* •Luggage delivery •Interactive television system to view & select shore excursions, order room service & watch movies* •Individual safe •Direct-dial telephone •Thermostat-controlled air-conditioning •Mini-bar* •Some staterooms may have a trundle bed *Additional charges apply. Stateroom Features All staterooms and suites come complete with private bathroom, vanity area, hair-dryer, interactive TV, radio and phone. Z - Inside Strm All staterooms include: two twin beds that are convertible to queen-size (unless stated otherwise) and sitting area, private mini-bar*, interactive Samsung flat-screen television system to view and select shore excursions, order room service, and watch movies*, private safe, and dual voltage 110/220AC outlets. (183-200 square feet) Amenities included are: robe, custom blended bath products (shampoo, conditioner and lotion), shower cap, cotton balls and cotton swabs, water/wine glasses, Celebrity eXhale™ bedding featuring custom premium mattresses, plush duvets and pillows and 100% pure cotton linens, and hair dryer. *Additional charges apply.